Click here for complete list of songs. Click highlighted track title to listen to song sample. (About 1 Hour total audio. 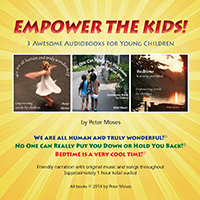 Three inspiring audiobooks from Peter Moses plus engaging songs on each theme. Children from preschool through early elementary years will really enjoy the listening experience! Friendly narration by Rob Weir and Peter’s original tunes throughout. CD’s mailed within 5 business days. A wonderfully peaceful collection of songs, mostly original compositions with lots of love and tenderness. Children have responded, being extremely relaxed and sleeping before it’s done! Enjoy! Peter Moses' favorite original songs from three former cassette collections, newly remastered on CD. Heartfelt, inspiring songs for parents and teachers everywhere (and their kids) about fulfilling everyone’s need to feel respected, important, accepted, included and secure. 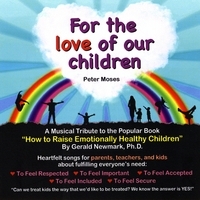 Motivational pop-rock, folk and blues, it’s a musical tribute to the popular book “HOW TO RAISE EMOTIONALLY HEALTHY CHILDREN”. 8) Living It, Being It! From kids pop-rock to jazz, world-beat to quiet relaxation, this collection has it all. 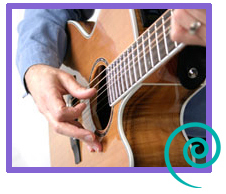 Upbeat musical messages of joy, self-esteem and a positive world-view saturate the songs. From kids pop-rock to jazz, world-beat to quiet relaxation, this collection has it all. Peter's CD collection of lyrical, passionate, spiritual songs. Original tunes and uplifting words to inspire Self-realization and our inherent joy and freedom found only here & now. 16 acoustic compositions from the best of Peter's 20+ years of songwriting. Enjoy! 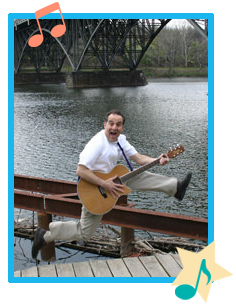 Peter Moses has been a singer-songwriter and recording artist for over twenty years. power of everyday life, of being human and of the discovery of Pure Being.